Description: Southbound loaded coal train - BNSF Beardstown Sub. Description: A nice power consist leads this train past Wyalusing State Park and over the Wisconsin River just south of Prarie du Chien. Nice to see a WC Painted engine in Wisconsin, a first for me. A little late in the game for that, don't you think? Title: Doggone it! Why'd they do this to one with a nice paint job? Description: The camera view finder is my picture window as BNSF 4128 enhances the sumptuous scenery. Description: There wasnt much happening, but this grain empty was a welcome development. 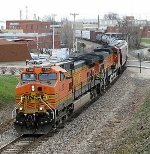 Description: BNSF Engines Numbers 527, 557, 4128, And 4133 in Centralia IL. 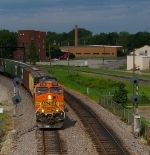 Description: Two BNSF GEs pull past Park Jct as they notch it up after getting the light.